Maine Weddings on shore of Wilson Lake, Wilton, ME Wilson Lake Inn is nestled in the foothills of Western Maine on the shore of beautiful Wilson Lake. It is a wonderful choice for a unique and beautiful outdoor Maine wedding. You will exchange vows in the company of family and friends in this beautiful waterfront setting surrounded by landscaped grounds and perennial gardens. 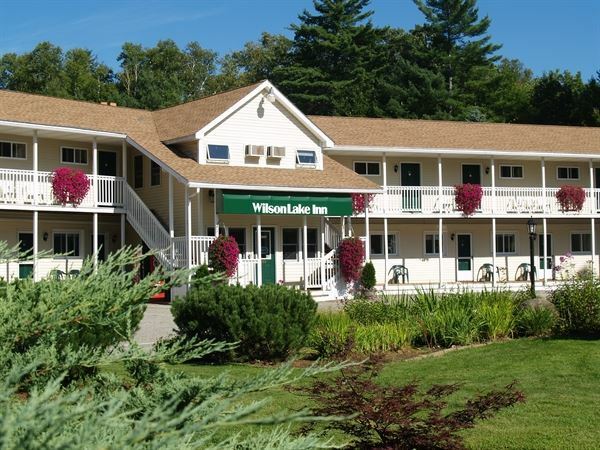 Wilson Lake Inn is a wonderful choice for a unique and beautiful outdoor tented wedding in a setting with a breathtaking backdrop that includes one of Maine's prettiest lakes in the foothills of western Maine. Exchange vows in the company of family and friends in this beautiful waterfront setting with groomed grounds, perennial gardens and a gently sloping path to Wilson Lake. Bride and groom enjoy complimentary two nights stay. What a great advantage to you and your guests, ceremony and reception at one venue! Please contact us for complete terms & conditions by calling 207-645-3721.